I just took this record out of the sleeve (which has a .50 CD/Game Exchange sticker dated Sep 13 of '03), and upon inspection, the vinyl is Year of Sunday by Seals & Croft. Is it possible that this has been sitting on my shelf, unplayed, for five years? And even worse, I've had a Seals & Croft record in my possession for those five years? I could have sworn I listened to this at least once. That's too bad seeing as how this record rules. And I mean that non-ironically. "Celtic Soul Brothers" is about as perfect a song as there is. 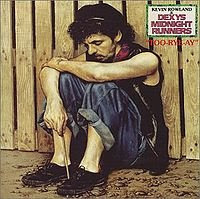 Kevin Rowland has one of the more underrated voices in the biz. "All In All," "Plan B," and "Come On Eileen" are all unbeatable tracks. Got to love those wild 80s.